This wonderful season paints a magnificent picture on the earth’s canvas in the form of vibrant blooms. For many artists, writers, poets, spring has been a great source of inspiration. No wonder, some of the most beautiful poems were written in spring. The nature is waking up and people all over the world spend more and more time outside. The Land of Fire comes alive in March with the arrival of spring marked by the annual Novruz festival. Scientific researches relate the Novruz Holiday with the prophet Zardush that dates 3500-5000 years back. Spring officially arrives in Azerbaijan on March 20-21, awakening nature and all of its beauty. The Last Tuesday is believed to be very special as just a few days separate people from the great feast. 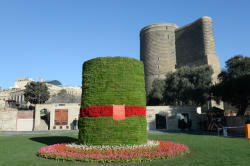 On this day, Azerbaijani people pay tribute to mother earth and its riches. Since ancient times, people depict Earth as a loving mother because it is the place we live on. The idea that women and Earth are inherently linked has a long history. Expressions such as "mother earth" and "motherland" probably resulted from these beliefs. People also refer to Wind Tuesday as Fathers’ Tuesday, Ancestors’ Tuesday or Black Tuesday. During this evening everyone should visit the graves of their relatives and loved ones. Everyone must celebrate the Earth Tuesday at home otherwise they will celebrate Novruz away from home for 7 years. The spring festival is also the time of fortune telling. A young girls' favorite tradition on this Tuesday is a "gulag faly" - a divination. You have to make a wish in the evening, and then eavesdrop at someone's door or window, and listen to what the owners are talking about. If you hear good words, it means your dream will come true. Therefore, they say that a lot of nice and pleasant things should be said on this day. The smells of Novruz surround people everywhere- mouthwatering pastries, walnuts, dried fruits are put on the table. On the eve of the spring holiday, people tidy up their houses, cook the main Novruz sweets shekerbura and pakhlava. A few weeks before Novruz, women take wheat seeds, water them and sing the traditional song "Samani, protect me, and I will grow you every year." 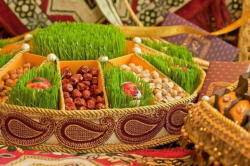 The decoration of the festive table is khoncha, a big tray with "samani" - freshly sprouted wheat. Samani is a symbol of hope for an abundant harvest in the coming year. It is essential on this day to have seven dishes the names of which begin with the letter "s". For example sumakh(a kind of spice), sirke(vinegar), sud(milk), samani(grown wheat), sebzi(fried meat with greens), etc. There should be also a mirror, a candle and a painted egg on the table. During the holiday, people usually give each other a holiday portion called "Novruz payi". Traditional sweets, samani and candles are put on a tray and given to the neighbors and friends. In the evening on March 21, all family members gather at home for dinner to eat pilaf (rice) and celebrate the spring arrival. A series of events are being held across the country. Spectacular shows are performed in public squares. Tightrope walkers demonstrate their skills, wrestlers test their strength while beloved Novruz characters - Kechel, Kosa ,Bahar gizi (Spring girl), as well as Dede Gorgud welcome and congratulate Azerbaijanis on this day. Khidir Ilyas and Kos-Kosa are among the most popular traditional Novruz games. In Papaqatdı, young people knock at the door, throw their hats down and hide. The homeowner finds the hat, fills it with sweets gifts and places it back outside the door. Novruz is celebrated by millions of people throughout the world including Azerbaijan, Iran, Afghanistan, Uzbekistan, Tajikistan and other countries.